Fly fishing equipment is not available for rent. Guides can be hired for the day. The weather can change abruptly and the air is dry. We recommend to use various layers. 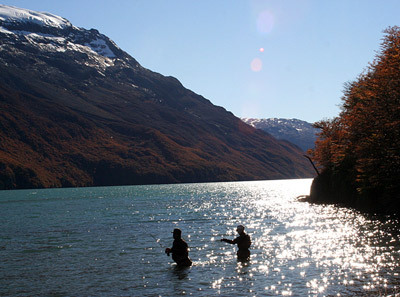 Fishing Permit: can be get in El Chalten or at the Lodge. Fly Fishing season: from November to May. The lake, it is 12 km long, surrounded by natural forest all the way to the edge of the water. It offers a variety of beaches and wide bays for long and short casting. It is surprising the amount of springs that flow into the lake. Along the whole way you will have the view of the Mt. Fitz Roy and Vespiganani Glacier. The options of different bays permits to choose the right spot depending on the wind conditions. It is recommended to use fishing pole of 4/5, floating lines, long tappered leader of 9' for better results. There is good fishing in the lake. 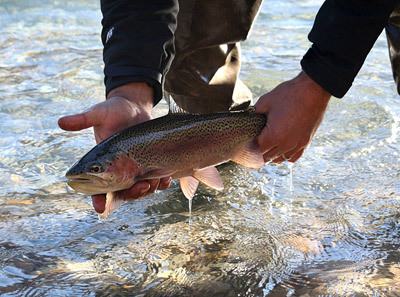 You can catch the rainbow trout or the brown trout of 1 to 2 kg average. Big cliffs can be found in the lake shore, offering deepwater, a perfect spot to use sinking line that might give you a nice surprise. After a great fishing day you will have a cozy and comfortable place with good wine, delicious meals and great company waiting for you. The road goes 35 km along the river. You can find rainbow trouts. From the beginning of the river in the Lago del Desierto to the confluence with the Toro river must catch and release and only one hook without barb must be used. 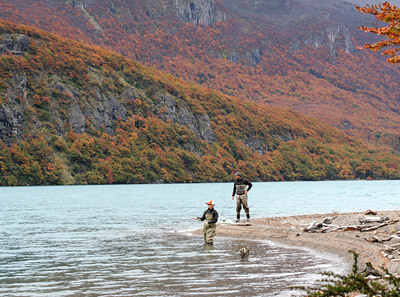 From Toro river till the river mouth in the Lago Viedma please check on the current regulation in the Lodge. It's a 5 km from the North point of the lake, there are rainbow trouts, and is accessible by foot. The River mouth in the North point of the Lake is accessible by boat, 7 km.